Post-Barcelona Meeting Info120 participants from twelve European countries and the US came to Barcelona for our first EPIC-Europe meeting of its kind this May. It was a lively and inspiring event. 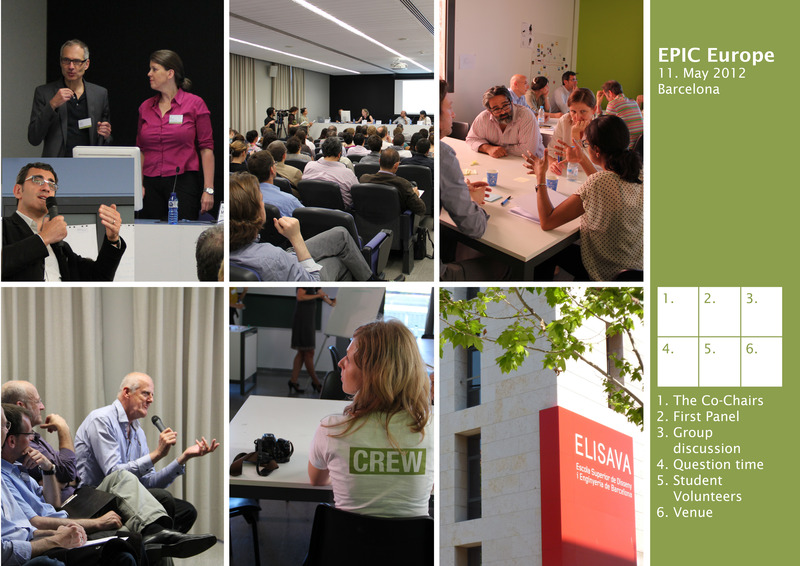 Many thanks again to the student volunteers, our sponsor, to our host Elisava – and to all the participants! 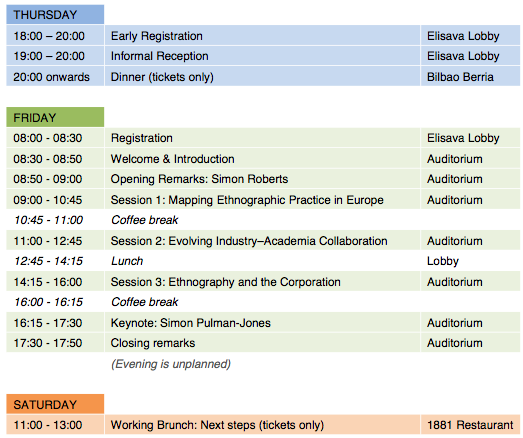 Find below the programme outline, notes from the workshops, the list of attendees, some pictures, and remarks on next steps. Next steps As discussed at our Saturday morning brunch, there is strong interest in a follow-up event next year and in establishing a European network of ethnographic practitioners in industry. We have now started to think about the requirements for an internet platform that will allow all of us to communicate and organize ourselves. Come back here for news on the platform soon. Post-Barcelona meet-ups … have taken place so far in Munich and Berlin (read about it here – a more detailed report by the organizers will follow soon). Let us know of any others. Talk to you soon! Dear Friends of the Barcelona Meeting and ‘EPIC Europe’,we have an opportunity now to craft a new organisation that supports our community and builds on the networking and knowledge sharing begun in Barcelona. So lets talk about our future direction. If you came (or wanted to come) to Barcelona or are someone interested in applied ethnography in business or organizational contexts in Europe, please join the conversation on our future.We believe it is important to have a public discussion on our core mission and scope, particularly as in our own recent internal discussions two somewhat different views emerged. What should our core mission be? a. One view holds that our organizational focus should be on new ways of thinking about design and innovation and the changes that we want to initiate. This view recognizes that the idea of ethnography may be what motivates many, but is still interested in widening our future mission beyond a method and beyond ethnography.b. The other viewpoint, which currently is probably the majority, is that ethnographic ways of thinking and knowing are our current common denominator and glue and should be so in the future. This view also wants to explore the wider context of new approaches to design and innovation but with a primary starting point in ethnography. In addition, what scope would be best to build our organization? Should it be globally oriented from the start? Or should it focus first on Europe and over time become global by aligning with similar groups elsewhere? We invite your contributions to this conversation about the future of “the group formerly known as EPIC Europe” on our LinkedIn group site until October 20th.